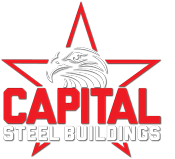 Capital Steel Buildings, Inc provides all types of outstanding residential buildings. Whether it’s your cabin in the woods or the back yard workshop, Capital Steel Buildings, Inc. provides an American made, low maintenance structure guaranteed to look great. Overhangs & wainscoting are great ways to customize your new building. Precisely Designed to Meet your Needs. Our residential steel buildings are fully customizable and are designed to meet all your residential needs. Residential steel buildings save you time and money compared to a conventional building. Our steel residential buildings are made from 100% American commercial grade steel. A wide variety of colors are available to choose from for your steel residential buildings. Our steel residential buildings are engineer-certified to meet local building codes. Steel Construction that has the ENERGY STARR label reduces energy consumption because they conserve up to 95% of their reflective economic value. By constructing with steel there is less waste, up to 95% recycled material and is 100% recyclable itself. Let Capital Steel Buildings, Inc. show you how to save on overall costs, construction and time by opting for a steel building solution.